Shoe is very comfortable. I walk all day at work and I needed a good pair of shoes.glad I got them!! Good shoe. Been nice and comfy for 8 hours. Work outside so I love the grip. I've been wearing nurse mates for the last 10 years.This year I'm on my second pair because the first pair fell apart.Then I purchased another pair London s and they are 91/2 wide and hurt my feet seems like the are so stiff. 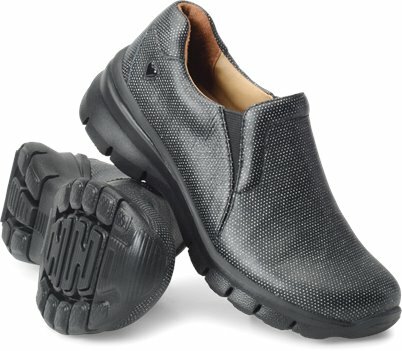 Best shoe ever------soooo comfortable....never think about my feet when working....can go all day. I purchased a second pair. Great shoe. Many compliments on the color. Very comfortable first time I wore them was 12hrs, definitely will buy again. Best shoe ever, ordering another pair, comfortable. Absolutely love the shoe! Ordered it in my usual size and found my foot sliding forward causing pain in my toes. No half size for 10's so I purchased the 11 and wear heavy socks. I'm complimented frequently on the style and color of the shoe. I purchased the Black Prism and it matches everything nicely! Nice fit, good price. This is the only model I buy for work. I have been wearing this style for many years and I plan on wearing them for years to come. I love my shoes but the black pair, which I wear all the time have been through a lot. I was in a care facility after heart surgery and the workers put my shoes on over my heavy socks (they have you wear) so they have been broken down around the backs. They are really the most comfortable shoes I have ever worn. I have a white pair also but don't wear them much. Really want 2 black pairs but can only do one pair at a time. Am so happy to see where I can order them on line and will do the first of next month. I received my shoes yesterday and thank you shoeline as I needed a new pair.